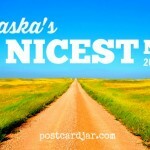 Lots of interesting things were invented in our home state of Nebraska. Yes, we’re the creators of vise grip locking pliers, frozen TV dinners, collapsable voting booths, and center pivot irrigation. Perhaps our biggest claim to fame, however, is the fruit-flavored, powdered soft drink that known around the world as Kool-Aid. 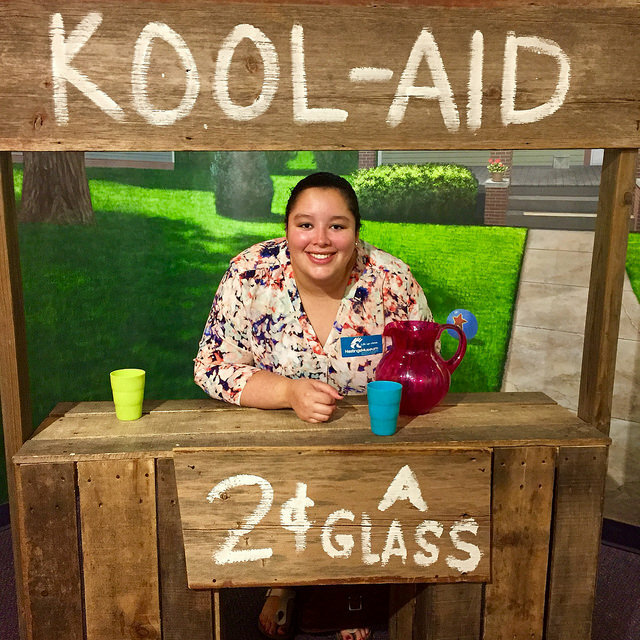 Our daughter, Meghan, took her turn at the Kool-Aid stand photo booth at the Hastings Museum. That’s right. Kool-Aid was invented by Edwin Perkins in Hastings, Nebraska. Perkins had initially created a fruit-flavored drink called Fruit Smack. But in 1927, in an effort to reduce shipping costs, he discovered a way to remove the liquid, leaving only a powder. 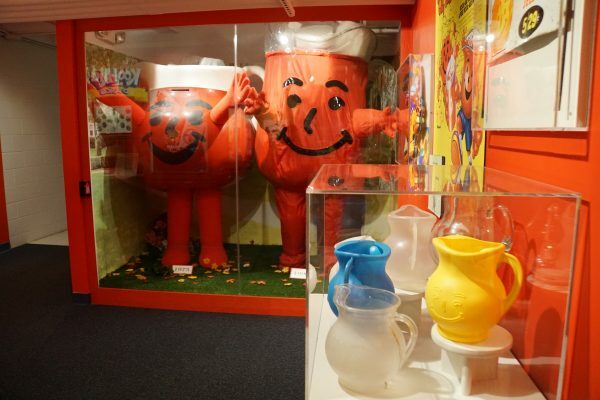 These Kool-Aid man costumes were are display at the Hastings Museum. He named the new powder Kool-Aid and moved production to Chicago in 1931. Eventually, the brand was sold to General Foods and is now owned by Kraft. However, Hastings still celebrates Perkins and this childhood favorite with an annual summer festival called Kool-Aid Days on the second weekend in August. They also help commemorate Perkins’ achievements with an exhibit in the Hastings Museum, which we visited this summer. It was our very first trip to the museum and we found it a delightful way to spend an hour or two on a hot summer day in Nebraska. 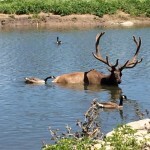 It was interesting to animal species in their natural habitats at the museum. wide screen and large domed Planetarium. 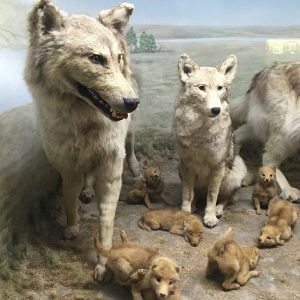 It houses taxidermy displays dozens of animal species set in their natural habitats, allowing you to get an up close look at many amazing creatures! The museum also chronicles the history of the early inhabitants of the Nebraska plains, from paleo-Indians to euro-Americans, while providing a look back at the creatures that used to roam this area and swim in Cretaceous Sea. 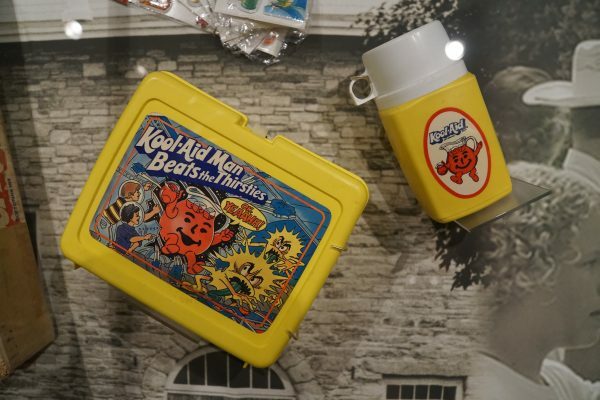 Our favorite part of the museum, though, was the nod to Kool-Aid. It was fun to walk through the exhibit and read all about the history of Perkins’ invention and look back at all of the advertising and marketing campaigns that were so prominent in our childhoods. We learned that the original six Kool-Aid flavors were Cherry, Grape, Lemon-Lime, Orange, Raspberry, Strawberry — my favorite is Cherry and as I recall, it produced the best Kool-Aid mustache/smile. Kool-Aid marketing was everywhere when I was a kid. Lunch boxes, Barbie dolls, sno-cone machines. etc. I remembered the Kool-Aid lunchbox and round pitchers that everyone used to have. We were also reminded of the make-shift Kool-Aid stands we had as kids and enjoyed watching all of the old Kool-Aid commercials that feature a large, anthropomorphic pitcher filled with Kool-Aid randomly busting through fences and walls of children’s homes to make a batch of Kool-Aid. Here’s a little trip down memory lane in case you can’t remember who awkward those commercials really were. Maybe it’s just me, but some of these seem a little creepy to me now. But back in the day, there was nothing quite like seeing that giant pitcher of Kool-Aid burst through the wall at the most unsuspecting moment with that shout of, “Oh, yeah.” These commercials took me back. Today, you can buy Kool-Aid as a powder, jammer, burst, or liquid. A simple search on Pinterest will give you dozens of ideas on other ways to use Kool-Aid, including everything from dying t-shirts and and making scented play-doh, to using it as a watercolor paint or a dishwasher cleaner. I even found a recipe for Kool-Aid slime! What unique uses have you found for Kool-Aid? Let us know. We’d love to hear from you.